Cold Brew Coffee! Fish Sticks and Custard! Midnight Mug Cake! I’ve loved Alton Brown since watching his show Good Eats on Food Network (as well as Iron Chef America and Cutthroat Kitchen). His cookbooks are always fun to read as he offers commentary on the science behind the ingredients, humorous insight on why he likes a particular recipe, or some history of each dish. These 101 recipes include his personal favorites or things he eats on a daily basis “from morning to late and night and everywhere in-between.” Recipes are arranged by the time of day: Breakfast, Coffee Break, Noon, Afternoon, Evening, Anytime, and Later. Recipes range from classics, such as meatloaf or peanut butter cookies, to new twists with EnchiLasagna (enchilada + lasagna). Separate sections are included that focus on pantry basics and kitchen tools. He explains his methodology within these sections and throughout the different recipes which I thought was fascinating. One note to point out, if you don’t have a kitchen scale, is that he does use both cups and grams in different recipes. For the few specialized kitchen tools, he does offer explanations and alternatives which is always helpful. If nothing else, check it out for the pictures (which were all taken on his iPhone). The food looks gorgeous. Brown, A. (2016). 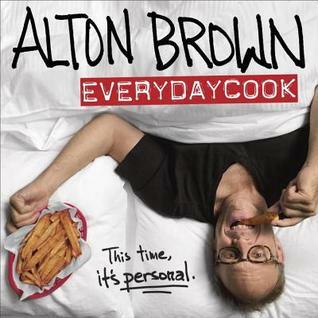 Alton Brown: EveryDayCook. New York: Ballantine Books. Fish Sticks and Custard! I’ve loved this since Matt Smith #10 made it cool.